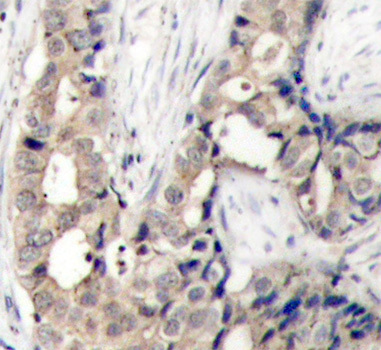 Immunohistochemical analysis of paraffin-embedded human breast carcinoma tissue using Phospho-ABL1-Y412 antibody. 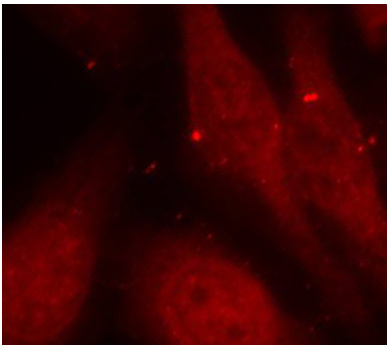 Immunofluorescence staining of methanol-fixed HeLa cells using Phospho-ABL1-Y412 antibody. Store at -20 degree C (regular) and-80 degree C (long term). Avoid freeze/thaw cycles. Small volumes of anti-ABL1-Y412 antibody vial(s) may occasionally become entrapped in the seal of the product vial during shipment and storage. If necessary, briefly centrifuge the vial on a tabletop centrifuge to dislodge any liquid in the container`s cap. Certain products may require to ship with dry ice and additional dry ice fee may apply. The ABL1 protooncogene encodes a cytoplasmic and nuclear protein tyrosine kinase that has been implicated in processes of cell differentiation, cell division, cell adhesion, and stress response. Activity of c-Abl protein is negatively regulated by its SH3 domain, and deletion of the SH3 domain turns ABL1 into an oncogene. The t(9; 22) translocation results in the head-to-tail fusion of the BCR (MIM:151410) and ABL1 genes present in many cases of chronic myelogeneous leukemia. The DNA-binding activity of the ubiquitously expressed ABL1 tyrosine kinase is regulated by CDC2-mediated phosphorylation, suggesting a cell cycle function for ABL1. The ABL1 gene is expressed as either a 6-or 7-kb mRNA transcript, with alternatively spliced first exons spliced to the common exons 2-11.